Jean-Claude Juncker won the support of Europe’s lawmakers to become European Commission president, despite the opposition from Britain. It was clearly a slap in the face to Britain and it is highly doubtful that his leadership will be able to patch up relations with the U.K.. The 59-year-old must boost economic growth, deal with massive deflation, rising civil unrest, tremendous dissatisfaction with the idea of the EU in Italy, France, and Spain especially, and confront the possibility of a British exit from the 28-nation EU stemming from U.K. Prime Minister David Cameron’s pledge to scale back the bloc’s powers and to hold an in-or-out referendum on membership. Each member state appoints one commissioner, whose portfolio is assigned by the president. 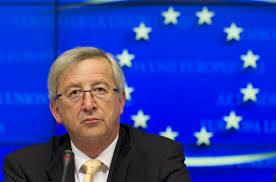 The assembly endorsed Juncker by a vote of 422 to 250 with 47 abstentions. He will now become the new dictator with no new ideas for a five-year term once Barroso, in office since 2004, steps down at the end of October.